The artists receiving this year's lifetime artistic achievement award on Sunday are Cher, composer Phillip Glass, country music legend Reba McEntire and jazz icon Wayne Shorter. 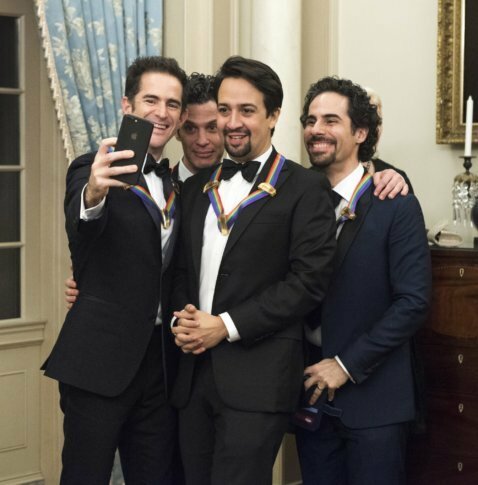 WASHINGTON (AP) — Last year’s Kennedy Center Honors ceremony was almost overshadowed by controversy surrounding the sitting president. This year’s event took place in the shadow of the death of a former commander-in-chief. Within days of that White House visit, Estefan’s tour bus was in a serious accident that left her nearly paralyzed and President Bush called her in the hospital, she said. The Trumps skipped last year’s ceremony after several of the honorees — most notably leftist television producer Norman Lear — threatened to boycott if he attended. This year, nobody issued that kind of overt threat, but the Trumps still announced three weeks ago that they wouldn’t attend. This year’s honorees for lifetime achievements in the arts were superstar singer Cher. composer Philip Glass, country music legend Reba McEntire and jazz icon Wayne Shorter, while an unprecedented special award went to the creators of “Hamilton” for their genre-bending musical. The night kicked off with a salute to McEntire, who was introduced by music star Kelly Clarkson, who performed McEntire’s hit song “Fancy” after surprising her on the red carpet. Next, Shorter was hailed by the Kennedy Center for a six-decade career that included collaborations with Art Blakey, Miles Davis, Carlos Santana and Joni Mitchell. Esperanza Spalding, Herbie Hancock and Renee Fleming performed in tribute to Shorter, while Jason Moran, the Kennedy Center’s artistic director for jazz, described Shorter’s music in celestial terms. “I had a non-sober G-Chat from Mexico saying, ‘I’m watching Season 1 of ‘Mad Men’ on DVD and reading this really great book on Alexander Hamilton. I think there’s something here,” Miranda told WTOP on the red carpet. Their return to D.C. was a full-circle moment, as Kail grew up in Alexandria, Virginia and Miranda first performed a number at a White House poetry jam in 2009. “That moment is sort of a microcosm of our entire experience: I tell you the pitch for the musical, people laugh, then you get swept up in the story,” Miranda told WTOP. After an intermission, Glass received his tribute from a fellow Kennedy Center Honors recipient: singer-songwriter Paul Simon. Last but not least, comedian Whoopi Goldberg kicked off a tribute to Cher in a flowing sparkly gown that she joked came from the pop music icon’s closet. On the red carpet, Cher reflected on her Oscar-winning role in “Moonstruck” (1987). She also described the challenges in trying to reinvent herself over the decades. The evening ended with Adam Lambert performing his own rendition of “Believe,” followed by Cyndi Lauper, a longtime friend of Cher’s, performing “If I Could Turn Back Time.” The duo wrapped the show with a duet of “I Got You Babe,” made famous by Sonny and Cher.